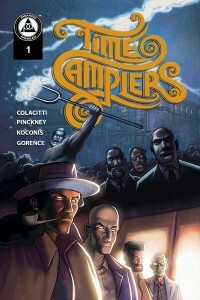 Time Samplers #1 is a featured comic at ComiXology Submit — the ComiXology publication for promoting indie comic book and graphic novel creators. Written by Thomas Gorence, Erik Koconis, and David Pinckney with art from Christopher Hanchey, this is the story of a team of modern day investigators who solve problems by “sampling” events from the past. Read on to find out my thoughts!